With Steel Banding Across the Base of the 5/4 Solid Maple Frame. (Not Hardwood Plywood) SAVE in Dakota leather. On Sale in Two Depths 38" and 42"
U Chaise Sectional, And Take a Part Sofa. Price includes professional in-home delivery almost everywhere. 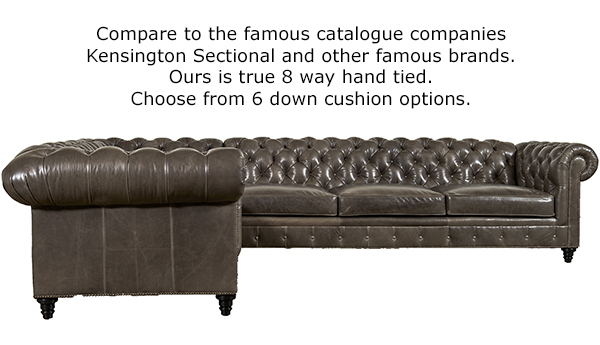 Featured Article: Compare the Kensington, Wessex and other Tufted Leather sofas to the Casco Bay Furniture Kingsbridge Chesterfield. Premium Dakota Leather on Sale! Dakota leather is tanned on handpicked European hides in order to celebrate the natural hall marks of nature. Dakota is finished with wax and oils. These waxes are meticulously applied by hand in layers to impart the leather with a vintage appearance. This is a supple leather that will improve over time. It is available in 11 colors. from Bassano Del Grappa, Italy. For those who want the very best! This leather is the original Brompton leather finished with wax and oils. This supple leather improves over time, developing a rich natural vintage appearance. Don&#39;t be fooled by knockoffs of this leather seen elsewhere. Available in the original : Brompton Black, Black and Blue, Chestnut, Cocoa, Spanish Moss, Vintage, Walnut and Wolf. New from the Italian Tannery, Echo and Mont Blanc leather. Echo and Mont Blanc have similar characteristics to Brompton and are comparable in quality. Echo and Mont Blanc, available in 72 colors, are more pliable and a little softer. Our Leather Options, exclusively distributed by Moore and Giles. We carry 149 full grain, fully aniline dyed leathers representing the top 2-3% of leathers used on upholstered furniture. These leathers are for those that appreciate the natural beauty of leather including natural beauty markings. Our collection features 3 carefully selected high-quality, matt finished leathers. We are also featuring Becca leather with a protective finish. Click Here to view these Premium Leather Swatches. Additional furniture photos can be found by scrolling to the bottom of this page. ►True Eight-way hand-tied spring suspension - Built to Last a Lifetime! 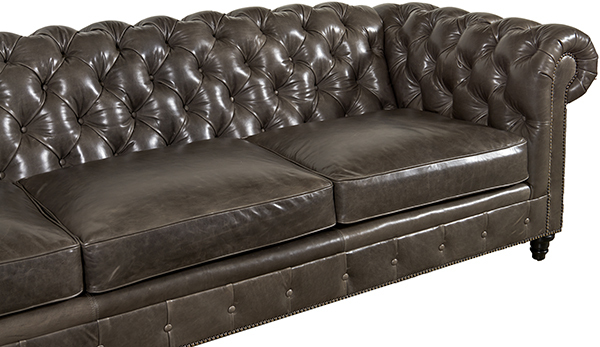 Our leather sofas have traditional True 8 Way Hand Tied Hand Knotted Spring Construction [photo] - the ultimate in durability and comfort. Each spring can move independently in any direction. Superior to "No-Sag" Sinuous Springs Systems [photo], machine made "Flexolator TM" [photo] suspensions and "Pirelli Webbing" [photo] suspensions. Webbing suspensions are constructed with interwoven rubberized fabric strapping. Sinuous, Flexalators TM and webbing suspensions can only move up and down. They are hard on cushions. They will bottom out. Also be aware of Drop in Spring Units. There are of two types: Drop In Coil Units [photo]and Drop In Pocketed Coil Units [photo] called "Softluxe TM". The Drop In units are not built into the frames and as a result lack torsional strength. They are pre-assembled units made outside the furniture. The Drop In Coil Unit consists of a wire or wooden box with springs set into the box. The unit is attached to the frame by screws along the top of the frame and are held in place by rails along the bottom of the frame. 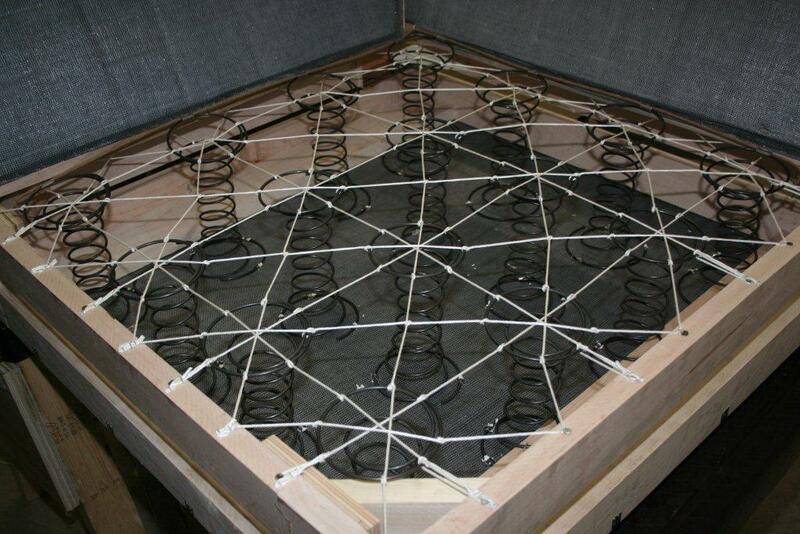 The system will sometimes have cording tying the springs but the cording has minimal value as the springs are held in place by metal clips and the springs cannot move freely. Be cautious... Retailers and catalog companies will refer to Drop in Coil Units as 8 way hand tied. 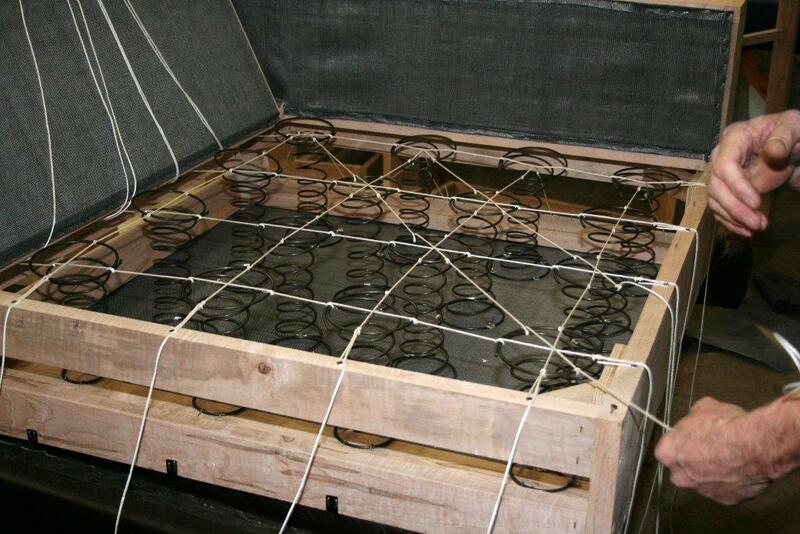 Pocketed Coils were derived from the mattress industry. Essentially preassembled units comprised of a series of small springs encased in fabric. Typically the wooden frame of the sofa is turned upside down, polypropylene fabric is stapled to the base of the frame. The frame is turned back over and glue is sprayed on the poly. The pocketed unit is then glued to the Poly. Visually they resemble little mattresses glued to poly. Retailers will tell you these other type of suspensions are as good as a True 8 Way Hand Tied Hand Knotted Springs. They are not. They are much cheaper to build, take minutes to assemble and have limited longevity. 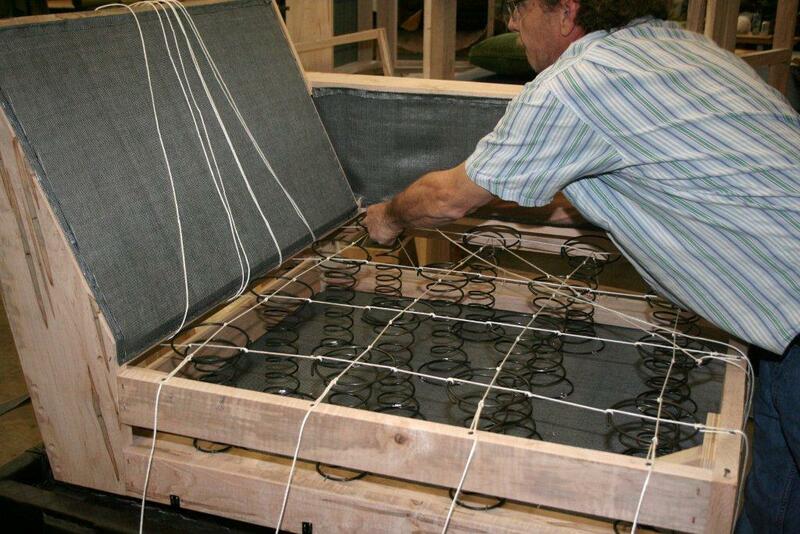 True Eight-Way Hand Tied systems, taking hours to build, are found in only the best quality sofas. They are built to last for decades with even comfort. A new sofa is a sizable investment; make sure it will last by choosing the proper construction. 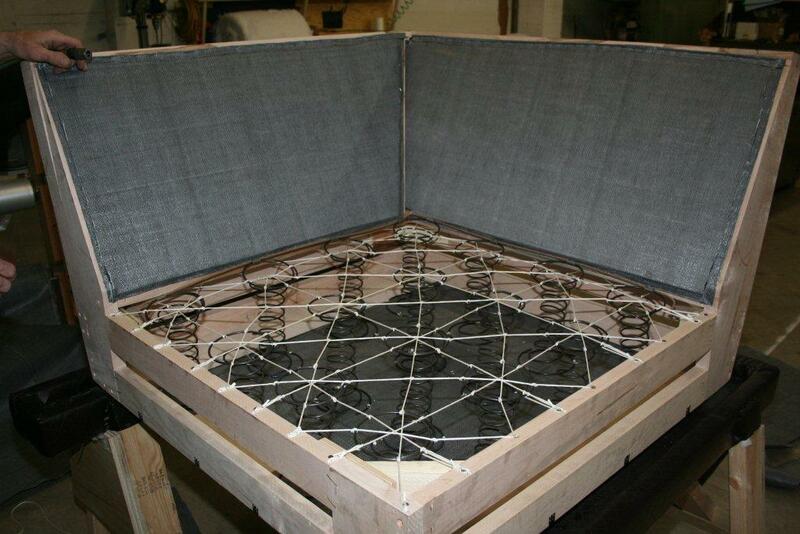 Want to know more about how our furniture is made? 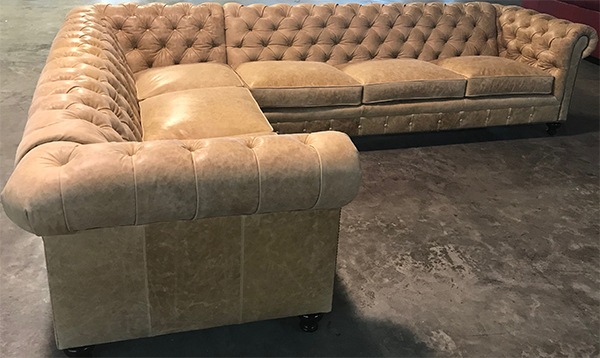 Read our article "An Interview With a High End, Quality Upholstered Leather Furniture Expert" and Factory Owner. ►Down Blend Seat Cushions are always free. Sterilized down seat cushions not only sit better, they look better as the cushions "crown" and have a more natural flowing appearance. Seat cushions are removable for ease of cleaning, service and superb seating comfort. This type of cushioning enables you to rotate seat cushions to minimize normal crushing. We offer five seat cushion upgrades for a nominal fee to suit everyone's comfort level including: Our New Ultracel Reflex Cushion comprised of three layers of Ultracel Foam with a down blend wrap for a softer seat, Ultracel 1.8 lb 21 IFD with a down blend wrap for a medium seat, Ultracel 2.5 lb 25 IFD with a down blend wrap for a firmer seat and for those seeking a heavy duty cushion and Ultracel Spring Down Cushions in regular and heavy duty. Call for details and to discuss which cushion will be right for you. (Ultracel is a long life, soy based foam). ► 100% Kiln-dried, double-doweled, corner blocked, 5/4" Solid Maple hardwood frames for maximum durability. No plywood, no softwood and no particle board. Built in North Carolina! We use 5/4 hardwood. Most manufacturers simply state that they use kiln dried hardwood which generally means hardwood plywood. 5/4 hardwood is the gold standard in frame construction. These frames are milled in the Appalachian Mountains of North Carolina and Virginia. Assembled locally. We use added hardwood stretchers across the base for added structural integrity. Many manufacturers use plywood frames often times referred to as Manufactured Hardwood. Don't be misled by those that tell you a plywood frame is as good as a hardwood frame. 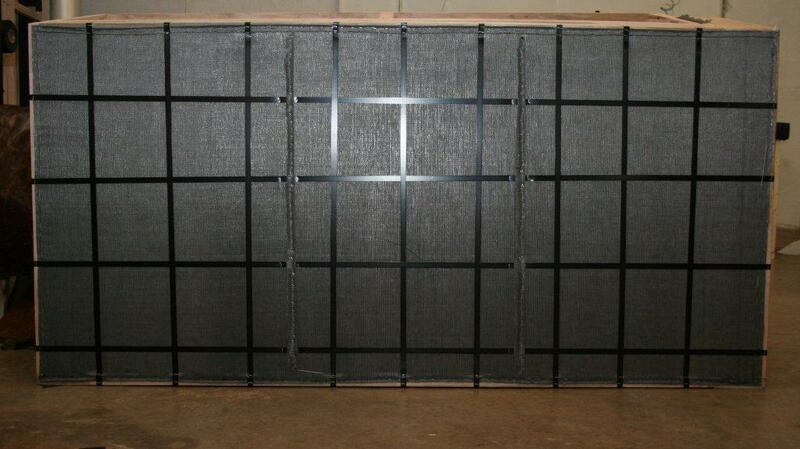 Manufactures like to use plywood frames as they are less costly to build. A plywood frame can be cut by a machine called a C and C router in a matter of minutes. Plywood flexes and does not have the rigidify of a hardwood frame. Hardwood frames do not contain the glues and byproducts of a plywood frame. Each frame is bench made by hand by skilled craftsman. Each piece features removable seat cushions for ease of cleaning, service and superb seating comfort. This type of cushioning enables you to rotate seat cushions to minimize normal crushing and to fine tune the back padding for individual taste. Legs are available in 8 finishes, Mahogany, Espresso, Cherry, Black, Light Oak, Medium Oak, Dark Oak, and Stone Washed. Click here to see the wood finish options. Leg Options For an additional $99 per piece you can choose from six other leg options. Each of these handmade solid wood legs are made by skilled woodcarvers in and around Hickory, North Carolina, never imported. The finish on our leg with casters is a dark antique color made to compliment our Antique Brass nailhead. Choose from a selection of 9 solid brass nail options: Choose from: French Natural (most popular), Pewter, Antique Brass, Golden Dome, Black Nickel, Nickel, Old Silver and spotted gold. Your choice only $199 per piece ($249 for sofas 100" and larger). All options are available in three sizes small, medium and large. Call for details. Click here to see the nailhead options. "New" Tufted Seat option: We are now offering the Kingsbridge with a tufted seat option. Call for Details. No need to worry about how to service your furniture should the need arise. Your piece of mind is assured with our 5 year Premium Protection Plan available for $299. Coverage includes, punctures, rips and burns. Unintentional damage from handling including all stains even bleach and caustic solutions. Coverage for dye transfer. Covers frame, spring, sleeper and recliner mechanisms. Features fewer exceptions than other plans. Full replacement feature. 30 day reporting period not the usual 5 day reporting period. Covers your entire order up to $20,000. Plan features in home service if possible. The service center may opt to perform the service in-shop and then return the item upon completion. All at no cost to you. Please see your actual warranty for terms and conditions. Save an additional $100 per piece in Dakota Leather! Free Professional In Home Delivery almost everywhere. Limited Time Offer April 1st - April 30th in Dakota only, free extended warranty, Save $299, free in home delivery and no sales tax in most states. Includes true 8 way hand tied hand knotted construction, down blend cushions and a 5/4 solid Maple frame (not hardwood plywood). Cannot be combined with other offers. Can be customized, call for details. Seat Depths : 42" Depth has a 25" Seat Depth & 38" Depth has a 21.5" Seat Depth. Sleep sofas area available on the 65", 75", 82", 89", and the 96" sofas. Call for details. Kingsbridge L Sectional 105" x 136" x 42"D x 32"H in Mont Blanc Wolf photographed in our factory. Close up of arm detail and tufting. Kingsbridge Sofa Chaise 105" x 70" x 42"D x 32"H in Berkshire Chestnut. 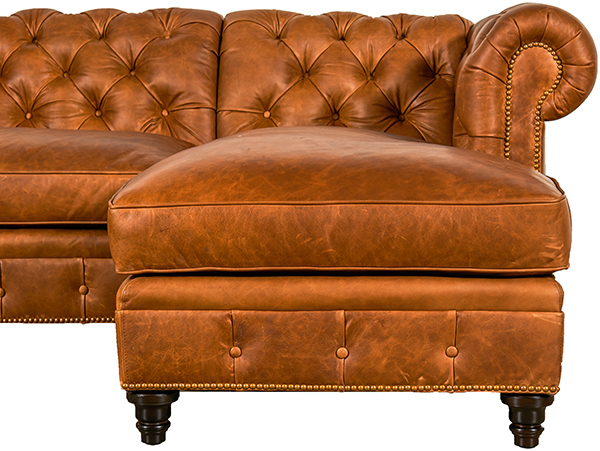 Kingsbridge Sofa Chaise Detail 105" x 70" x 42"D x 32"H in Berkshire Chestnut. Kingsbridge Sofa Chaise Side view in Berkshire Chestnut. in a lightly distressed Burnham Sunflower leather, tanned in New Zealand, as shown on the factory floor.